As a Club Member you will receive a continual 20% discount on each and every purchase from Mabel White DIY and gain immediate access to our Entire on line library of Mabel White eBooks. These eBooks include The Self Apothecary, and The Bathroom Chemist beyond hundreds of other books. Click here to see a list of major titles included. 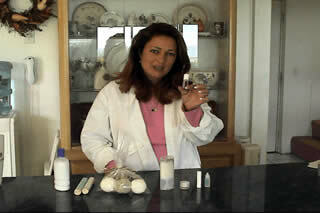 We will get you on your way to making your own lip balm, lotion, crèmes and more. Download immediately and get started right away! Beyond access to all eBooks-you get beta access to all PC Videos, to view on-line a value of $99.95. Click here for video list. Become a Club Member NOW and SAVE! Being a Mabel Member is $49.95 to start and $9.95 every 30 days after joining. *You can cancel at anytime although we work hard to provide quality material. Start making your own lip balm, candles, soaps, gifts, floral design and more and enjoy a 10% discount on any purchases, including clearance and sale items! Mabel White is a collage of continuous unique craft ideas with timeless appeal-hard to find recipes, formulas and natural homemade products such as soap and candle making that captures the spirit of a simpler time. Join our Club today and also get our One Hour Video The Bathroom Chemist that shows you exactly how to make lotion, balms, bath fizzies and more! Get it right the first time! Click thumbnails for a better view. FREE! Fragrance Oil Blending Chart! The newly revised Self Apothecary is one of the many books in Mabel's entire on-line library, with state of the art mentoring in making your own all natural body care products in the luxury of your own home. Using modern day technology we show you how to make just about everything in the bath and body care department au natural. You can make lotion and crème in a blender as well as bath salts in a snap. The Self Apothecary is also the first book to discuss the secrets of fragrance blending and is accompanied by a fragrance oil blending chart. This research alone took us 5 years to compile because few companies share fragrance oil blending secrets. In this book you will learn how to use 30 basic fragrance oils to make over 200 variations, for example ½ rose to ½ vanilla does make the scent of baby powder! As soon as you sign up to be a Mabel Member you enjoy 10% off all products and we mail you a one hour on-line Video movie that takes you through all of the basics of making your own toiletries at home. Mabel Member's are also allowed access to our cumulative library of all Mabel White PDF's and copy written work for their own personal use. In this on-line library archive is the Self Apothecary. *No reproduction of such material is permitted. In the private eBook on-line library you can also download How to Make Heavily Scented Candles, How to Make Gift Baskets, The Natural SoapMaker, Maid Holistic, London Apothecary just to name a few of our popular titles. THANK YOU for your interest in Mabel White! Perfect for a new crafter or homemaker this is a gift that keeps on giving!